We’d love your help. 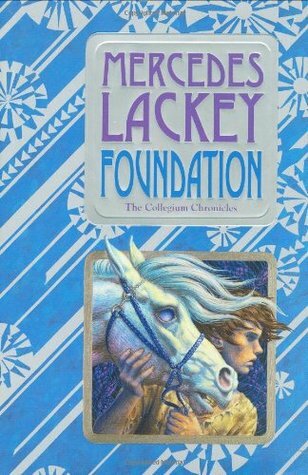 Let us know what’s wrong with this preview of Foundation by Mercedes Lackey. The long-awaited brand new novel in the bestselling Valdemar series. In this chronicle of the early history of Valdemar, Mercedes Lackey?s bestselling world, a thirteenyear- old orphan named Magpie escapes a life of slavery in the gem mines when he is chosen by one of the magical Companion horses of Valdemar to be trained as a Herald. Thrust into the center of a legend in the making, Magpie discovers talents he never knew he had?and witnesses the founding of the great Heralds? Collegium. Do you have to read all the previous Valdemar books or is it possible to read this as a stand alone series? I liked this book - although I read several bad reviews for it on Amazon. I want to know what happens next to Mags - and I don't care if they have fondue in Valdemar 500 years before Selenay or play "I Spy" at parties and even - GASP - call it "I Spy". I guess I'm just a Mercedes Lackey junkie. I didn't see the same flaws that had the other reviewers calling it lazy writing - what they pointed out as goof ups or flaws were things that I just accepted as part of the story. I guess that makes me u I liked this book - although I read several bad reviews for it on Amazon. I want to know what happens next to Mags - and I don't care if they have fondue in Valdemar 500 years before Selenay or play "I Spy" at parties and even - GASP - call it "I Spy". Let me start this review with saying I just finished reading this book for the third time, so needless to say I truly love this series. I have been reading Mercedes Lackey for years, I love her earlier work but her stuff in the past ten years or so have just been meh for me. This series makes me believe Lackey found what she was missing, the heart of her stories that Arrows, Winds, Magic, Oath, and By the Sword has. I don’t know if she just couldn’t give up her characters from Winds and just dra Let me start this review with saying I just finished reading this book for the third time, so needless to say I truly love this series. I have been reading Mercedes Lackey for years, I love her earlier work but her stuff in the past ten years or so have just been meh for me. This series makes me believe Lackey found what she was missing, the heart of her stories that Arrows, Winds, Magic, Oath, and By the Sword has. I don’t know if she just couldn’t give up her characters from Winds and just dragged them to their death, but the Storms and Owl series was just boring. I couldn’t sink myself into them as well as the others, I know I have read the Arrows trilogy more times than I can remember because I love it so. Now back to Foundation, it centers around a boy named Mags who’s life up until he was chosen was pure hell. If you are familiar with the Valdemar series then you know all Lackeys later books have heralds going to the Collegium to learn what it means, and what you need to know to be a herald. This is the start of that program, and not all in Valdemar are happy about it. Now Mags is a very bright, and taking like a sponge to water with all his lessons as well as making friends in all sorts of places. I think I see where Lackey is leading this series, I hope I am right because I have always wondered about this. I have read the first three books in this series so I might have some more insight in where this series is going so I am going to keep my mouth shut on my theory. I recommend this series to everyone, there is enough explanation in this book for people who haven’t read any of the Valdemar series. This book is the reader equivalent of a great home cooked meal, its perfect for a cold rainy day. So go grab a hot cup of tea, blanket, and pillow (I also recommend a warm puppy but not all of us are dog people) curl up on the couch and have a great read. I'm a Mercedes Lackey fan from way back. I devoured her 'Magic' trilogy and haven't looked back since. This is one fantasy author I continue to buy as soon as her books hit the shelf because I know the story will pull me in and have me cheering for the hero or heroine. Her newest "Foundation" is no exception and as a bonus, it's set in Valdemar! Mags is an orphan who ended up in the hands of a greedy cruel mine owner as a baby. His work in those mines began as soon as he was old enough to stand a I'm a Mercedes Lackey fan from way back. I devoured her 'Magic' trilogy and haven't looked back since. This is one fantasy author I continue to buy as soon as her books hit the shelf because I know the story will pull me in and have me cheering for the hero or heroine. Her newest "Foundation" is no exception and as a bonus, it's set in Valdemar! Mags is an orphan who ended up in the hands of a greedy cruel mine owner as a baby. His work in those mines began as soon as he was old enough to stand and hasn't stopped since. The conditions are harsh and survival is the only thing Mags has ever known. Until the day a beautiful white horse arrives and 'claims' him. Now, Mags is learning that the world is actually much bigger and much different than he could ever have dreamed. But his fears and lack of knowledge cause him to become a quiet observer of his new life. With the help of his Companion and a few new friends, Mags will needs all his old skills and the new ones he's learning to help foil a plot against Valdemar. Step One: Create a main character who is abused, socially stunted, living in abject poverty, living with religious zealots, or gay. Step Two: Have a Companion choose them. Step Three: Upon arrival in Haven, have them be awkward but keenly observant, picking up on a dastardly plot no one else has noticed, thereby saving the kingdom, while making friends, becoming more secure in their Gifts, and learning a few valuable life lessons along the way. Step Four (Optional): If you write a sequel, try to switch up the gender of the main character or at least give him/her a different sort of Companion. If the first was "mothering", make this one "sassy", "headstrong" or "wise beyond it's years". Also, it might be cool to add some smoochie stuff. Mocking aside, OMG I missed Valdemar books! They all follow almost the exact same plot, but who doesn't like to see a character grow and mature, find their place in the world, and save the whole Kingdom? How brilliant was this woman to craft a series with a couple hundred years of timeline to fill in, one book at a time? This book explores the start of the Herald's Collegium and has some almost interesting negotiations with some neighboring country or other. I prefer the books that focus on Valdemar's neighbors (like Karse or Rethwellian) but I"ll take what I can get. There is such an ease in Lackey's writing and in the little details that make this world such a rich and diverse place to visit. Groundbreaking literature? Hardly, but it nicely reminded me why I can read Lackey books again and again. "Początek" to bardzo typowa Lackey i każdy, kto ją czytał, wie, czego się spodziewać. To opowieść o dorastaniu i odnajdywaniu swojego miejsca w świecie. Głównym bohaterem jest doświadczony przez los nastolatek, Mags, który okazuje się być - a jakże by inaczej - wybranym na jednego z Heroldów Valdemaru. Akcja jest bardzo powolna i skupiona w całości na psychologii postaci. Mamy dużo opisów, niewiele dialogów i w sumie pretekstową fabułę. To bardzo wyraźnie jest pierwszy tom z serii. Kończy się w dość niezręcznym miejscu. Zarysowuje - nieśmiało wręcz - motyw na kolejne tomy. A sama akcja w tym tomie, cóż, jest dość infantylna. Rozwiązaniem zagadki nie ma nic wspólnego z wielkimi intrygami i walką o władzę. Ale w pewien sposób bardzo mi to pasuje. Mam dość opowieści o dzieciach/nastolatkach, które noszą na swoich barkach ciężar ratowania świata. Od tego są dorośli. Mags ma zakres obowiązków właściwy dla swojego wieku. Most of Lackey's novels follow an easily seen formula-the character has an unhappy to horrible life until they are Chosen, then everything becomes sparkles and kittens while they solve problems that only their special talents can fix. 'Foundation' is, sadly, not different. Despite this commonality, the plots are usually interesting and well thought out. This book, however, was very disappointing in that area. While character development is desirable, it was too great of a focus, and left little Most of Lackey's novels follow an easily seen formula-the character has an unhappy to horrible life until they are Chosen, then everything becomes sparkles and kittens while they solve problems that only their special talents can fix. 'Foundation' is, sadly, not different. Despite this commonality, the plots are usually interesting and well thought out. This book, however, was very disappointing in that area. While character development is desirable, it was too great of a focus, and left little room for an actual plot. The conclusion is clumsy and rushed, as though Lackey said, "Holy crap, this has to have an ending in ten pages!" No ending would have almost been preferable to the thrown together hash of lack-luster, unsurprising, and generally unentertaining last pages of this book. I had planned not to read any more of this author's books, having found them rather uneven, but this one was a find on the library discard shelf for a nominal sum. Having realised it was book 1 in a series, I decided to try this sample. The story conveys a slight deja vu feeling, as I had previously read her Arrows of the Queen. Mags is a young boy living a miserable existence who is chosen by a Companion, taken to Haven to start his education as a Herald, and is found to have a maturity beyond h I had planned not to read any more of this author's books, having found them rather uneven, but this one was a find on the library discard shelf for a nominal sum. Having realised it was book 1 in a series, I decided to try this sample. The story conveys a slight deja vu feeling, as I had previously read her Arrows of the Queen. Mags is a young boy living a miserable existence who is chosen by a Companion, taken to Haven to start his education as a Herald, and is found to have a maturity beyond his years and a gift for Mindspeech and other things .... However, this version of the same basic story is made more interesting by the Dickensian setting at the beginning, for Mags is an orphan. Along with other unlucky children, he is being used as a slave to mine jemstones. The orphange boss, and the mine owner, is meant to be providing them with a roof over their heads, food and an education, but the roof is a nest among straw in a shed, the food is the equivalent of gruel with the odd bit of burned bread or even dead cat, and the education is learning by rote as one of the owner's daughters leads them in extremely rudimentary lessons in reading and writing. Nevertheless, Mags is smart, has picked up more skill in reading than the owner realises, and is also adept at doing what he needs to do to survive, especially since the owner has occasionally made "examples" by beating children to death and then disposing of their bodies in the mineworkings. Despite this, all empathy and kindness has not been expunged from Mags, who is now about thirteen from what he can determine: he does give a bit of bread to a younger child who, through no fault of his own, has been unable sufficient jemstones. There is a mystery about Mag's origin: the mine owner occasionally delights in reminding him he is 'bad blood', having been found as a baby at a bandit camp when the bandits were suppressed. He doesn't know his real name having been nicknamed 'magpie' when it was found that he was more adept at others at panning the mine spoils for odd shafts of jems, a name that over time was shortened to Mags. Following his rescue Mags is bewildered by all the new things he has to encounter, but is reassured by his Companion, Dallen, through their mental bond, and gradually settles into a new life in at the recently founded school for Heralds at Haven. He is there at a time of great change, as the decision has only recently been made to have a Collegium for both Heralds and Healers. Previously, Heralds took one or two trainees and acted as mentors, and healers also took apprentices, but so many youngsters have been Chosen by companions in recent years that it was decided to adopt the model already used by the Bards and have a college for each one. New buildings are being constructed to house them all and the overcrowding in the interim means that Mags is given a cosy room in the special stable which houses the Companions (not the ordinary horses). At first, Mags' hard earned caution prevents him from making friends though gradually this changes and he is brought into a kind of inner circle around the King's Own Herald and a set of younger people in Haven, who seek to use his gifts to help keep a watchful eye on those who oppose the Collegium. For not all is sweetness and light, as he suspected. As this is only volume 1 in what appears to be a fairly long series, it is not surprising that most of the questions about Mags and about other odd events are not answered by the book's end, but that didn't trouble me. I'm sure Mags' origin will eventually turn out to be signficant and he won't actually be the child of bandits but a child they had abducted. I found the writing a little clunky at times and Mags is possibly a little bit too perfect. But he is quite an engaging boy with his "uneducated" way of speaking and through him the prejudices of certain individuals are highlighted. The background is also interesting: one reference to Vanje made it clear that this story takes place two or three generations after the "Last Herald Mage" trilogy, and hundreds of years before Arrows of the Queen and similar books. And there was a helpful explanation of exactly what the "eyes" are that magic workers experience watching them - these were a feature of one of the books I read recently, By the Sword, but there was no explanation in that book and I couldn't recall what might have happened in the "Last Herald Mage" trilogy to have caused such a phenomenon. I liked this a lot, but some clunky patches of writing and a little voice in my head relentlessly whispering "this is stupid" mean that I relegate it to 3 stars. If you're looking for moral complexity or beautiful prose, you should direct your gaze elsewhere. Mercedes Lackey writes uncomplicated characters, in simple sentences, moving through a world that is entirely black and white. If the protagonist thinks poorly of a character on page seven, by page 307 that character has been revealed as a proud, shallow, child-murdering, power-hungry weasel. Good guys are easily identified when they share their last piece of bread with a starving orphan or put them If you're looking for moral complexity or beautiful prose, you should direct your gaze elsewhere. Mercedes Lackey writes uncomplicated characters, in simple sentences, moving through a world that is entirely black and white. If the protagonist thinks poorly of a character on page seven, by page 307 that character has been revealed as a proud, shallow, child-murdering, power-hungry weasel. Good guys are easily identified when they share their last piece of bread with a starving orphan or put themselves in harms way to save a stray dog. I thought she was a god among writers when I first read 'The Last Herald-Mage' trilogy in early middle school, and I quickly devoured the rest of her novels the moment they came out. I still love the universe she created, and every now and again try and recapture that good old feeling. I picked this book up at my favorite bookstore - which foolishly provides nice comfy chairs right next to their shelves - and read it in about three sittings. (Yeah, right there in the store. Tsk, tsk!) I'd never read anything by Lackey before, although certainly her name must be familiar to anyone who frequents the sci-fi / fantasy section. I admit what drew me to the book in the first place was the audacity of namimg it "Foundation" (a word never used in the story, as far as I can remember), w I picked this book up at my favorite bookstore - which foolishly provides nice comfy chairs right next to their shelves - and read it in about three sittings. (Yeah, right there in the store. Tsk, tsk!) I'd never read anything by Lackey before, although certainly her name must be familiar to anyone who frequents the sci-fi / fantasy section. I admit what drew me to the book in the first place was the audacity of namimg it "Foundation" (a word never used in the story, as far as I can remember), which seemed to deliberately evoke Asimov's like-named series - one of the most famous of all time. I guess it acheived its goal, if goal it was, because I read the silly thing. And frankly enjoyed it. A good start, but something that Lackey has been falling prey to lately is a lot of build-up and not paying it off in a satisfying way. I saw this in her latest Elemental book, and also The Phoenix Unchained. An example from within the book is when Mags goes to a party, and Lackey spends almost two whole pages describing the food. Not necessary. She makes up for this (as always) with her characterization and conflict, but it is mostly unrealized. I assume she intends to finish it up trilogy-style A good start, but something that Lackey has been falling prey to lately is a lot of build-up and not paying it off in a satisfying way. I saw this in her latest Elemental book, and also The Phoenix Unchained. An example from within the book is when Mags goes to a party, and Lackey spends almost two whole pages describing the food. Not necessary. She makes up for this (as always) with her characterization and conflict, but it is mostly unrealized. I assume she intends to finish it up trilogy-style, but she used to write books that could stand alone and this one doesn't quite cut it. Also, how many times are we to read the sad tale of the mistreated and abused youth saved by Companian? This has elements of Talia, Lan, and Skif, and Mags doesn't live up to these other characters. One thing I did enjoy was the time period - one we have never seen before, the founding of the Collegium, only three generations after Vanyel. Early Valdemaran history is always interesting because it informs the later development. The Valdemar books are very much comfort reading-it was the first fantasy I every read and liked, back in high school, and I've always had a soft spot for them. The good guys are Very Very Good, the bad guys are Very Very Bad, and there are increasingly more details about life in a medieval(ish) society. overall, fun stuff, but definitely wait for the mass market. Najlepsze zastosowanie: Mags jest trzynastoletnim chłopcem, pracującym w kopalni. Od małego wraz z dużą liczbą dzieciaków wydobywał kamienie szlachetne — im więcej, tym lepsze jedzenie. Chłopak nigdy nie był najedzony, wyspany ani czysty; dla niego świat zaczynał się i kończył na kopalni. Żył zgodnie z regułami mu wyznaczonymi, nie widział sensu w sprzeciwianiu się, ponieważ nie widział dla siebie innej perspektywy — cóż innego mógłby robić? Może nie uważał swojej pracy za idealną, jednak nie wi Najlepsze zastosowanie: Mags jest trzynastoletnim chłopcem, pracującym w kopalni. Od małego wraz z dużą liczbą dzieciaków wydobywał kamienie szlachetne — im więcej, tym lepsze jedzenie. Chłopak nigdy nie był najedzony, wyspany ani czysty; dla niego świat zaczynał się i kończył na kopalni. Żył zgodnie z regułami mu wyznaczonymi, nie widział sensu w sprzeciwianiu się, ponieważ nie widział dla siebie innej perspektywy — cóż innego mógłby robić? Może nie uważał swojej pracy za idealną, jednak nie wiedział, co innego byłby w stanie robić i czy w ogóle miałby szansę żyć gdziekolwiek indziej. Jednak pewnego dnia jego życie się zmieniło. Wspaniałe stworzenie zwane Towarzyszem wybrało go i teraz Mags zostanie przeniesiony do Kolegium Heroldów, gdzie nauczy się, jak panować nad swoimi zdolnościami i jak pomagać innym ludziom. Na początku chłopak jest nieufny i nie do końca pewien, co powinien robić, jednak później dostrzega szansę na lepsze życie. Musi ją tylko wykorzystać. Bohaterowie: Tak naprawdę jedynym bohaterem, który został nam jakoś mocniej ukazany jest właśnie Mags. Z nim poznajemy świat i najwięcej swoich przemyśleń nam przedstawia. Mówiąc szczerze, nieco obawiałam się jako narratora chłopaka, który odkąd nauczył się chodzić, zaczął pracować — czy to w kopalni, czy to w kuchni, czy jeszcze gdzieś indziej. Bałam się, że jego brak wykształcenia i zamknięcie od zawsze w tym samym miejscu będzie nam za bardzo zawężać horyzonty i się nie polubię z Magsem. Ale było zupełnie inaczej. Chłopak okazał się być naprawdę mądry i zazwyczaj podejmował racjonalne decyzje — to i tak więcej niż się spodziewałam po trzynastolatku, poza tym dorośli też nie zawsze podejmują racjonalne decyzje. Mags ma w sobie coś, co sprawia, że bardzo mnie intryguje i nie mogę się doczekać aż będę miała okazję poznać więcej tytułów z nim w roli głównej. Całokształt: Na zdecydowany plus zasługuje przedstawienie niewolnictwa i wykorzystywania ludzi przez ofiarę. Mags bardzo racjonalnie podchodzi do tego tematu i w sensowny sposób tłumaczy dlaczego tacy ludzie nie walczą albo zastanawia się, co oni ze sobą zrobią, kiedy zostaną uwolnieni. Mimo że dla nas brzmi to strasznie i ciężko jest nam zrozumieć niektóre zachowania, to przyznać trzeba, że to wszystko jest prawdziwe i mimo wszystko dość zrozumiałe. Now I remember why I really like Valdemar books. It's a comfortable place to go back to. The plots are mpt very imaginative, but they make you feel good and I like the writing style. Here, why don't I jot down a few words about the entire series, and not just the first book (no plot spoilers). Lackey is perhaps best known for her long-running series about the fantasy kingdom Valdemar, and this set of five books are her most recent addition to the saga. The Valdemar books overall don't have to be read in any particular order; the series is made up of both sets of books (usually trilogies) and individual titles that are semi-independent of one another. However, it perhaps makes the most sense to read the stories in chronological order according to the history of the kingdom. The Collegium Chronicles , while the most recently written about Valdemar, take place fairly early in the history of the country. It's been quite some time since I visited Valdemar, and I was quite happy to go back again. I've enjoyed the previous stories I've read very much, and had been thinking of doing a complete reading of the entire series in chronological order, so I had no problem in jumping in with these, since they detail an earlier portion of the country's time-line. And---in general, I found the books to be quite enjoyable. I liked the main character and found his adventures to be quite interesting. While reviews for the series were mixed, this was in large part due to the leisurely pace of the stories, with unfinished plot points left hanging at the end of each of the first four volumes. Since these were published at a rate of about one book per year, some readers were very frustrated about all these loose ends regarding the primary plot, which dealt with the mystery of where Mags came from, who he was, and why strangers were hunting him down. However, since I had the entire stack of books at hand, this wasn't an issue for me---as soon as I finished one I was able to jump right into the next. Now, Lackey does have quite a knack for getting into her characters' heads, and imagining in complete detail the running commentary that fills their minds as they go about their daily tasks. In one sense this is a plus---we really get to see how these characters think. Problem is---she writes it all down, whether it has anything to do with advancing the plot or not! And this does tend to pad out her books to a certain degree. I love the stories and fantasy realms Mercedes comes up with---I can only wish I had such an imagination. But I think she suffers from the same problem as a number of other very popular and prolific authors, in that her publisher doesn't seem to edit her any more, and as a result there's a LOT in her books that could be trimmed to make for a much tighter story. Oh, I don't mind getting a moderate amount of unnecessary detail---I enjoy losing myself in these fantasy worlds. But I do have to admit that when we're talking about the mechanics of quality, first-rate writing, her books would be better with a strong editor at the helm. For instance---in one of these books, there was a passage written about how the villains were able to hide their wagon from the eyes of the good guys. The description went on in detail for an entire page, but---we simply don't need to know this! It had nothing to do with the plot---just two or three sentences about this would have been quite sufficient. Now---while each book was of a reasonable length, averaging out to 330 pages or so, all together this story did NOT need five volumes to be told. The text could have been edited and tightened down to four volumes. Heck, the complete tale could probably even have been knocked down to three 400-page books. Wanted a quick fun re-read for the first few weeks of class. Something that is very different from my books for college classes. Even though the book deals with some tough subjects, it is a good escapist read. I have read this book multiple times. Herald Mags early life struck a chord with me and I loved how his life ended up. This focuses on the time of the building of the Herald's Collegium and the change from a mentor relationship among the Heralds of Valdemar to holding full classes for the trainees. There have been so many trainees being chosen by the Companions there aren't enough trained Heralds to have one on one training. Unfortunately, there are some Heralds that are having issues with the changes and aren't taking it well and the new trainees are caught in between. Another Valdemar novel set in the time period prior to the Seleny novels but after the Mage Pawn and Griffin series. AS in the early volumes of each trilogy, this is more abbout introducing the characters, and leaves us kind of right in the middle of the story at the end. Its engaging and Mags, the main character seems to have several mysteries that will probably be fleshed out in the later books. Nothing amazing, but another nice little story in the Lackey universe. Like much of Lackey's recent work. I read 90% of the book learning the detail of the world and the intricacies of the main character (loving both by the way), but only after that 90% did any sort of plot emerge and that was superficial and unfinished. If you're a Lackey fan, give it a try. If you've never read Lackey, this is definitely not the place to start. i suspect i could have chosen a more exciting valdemar book as my first experience of mercedes lackey's writing but, although not very much happened until the last 50 pages or so, it was still interesting enough and i'll probably read the other books in the series, to see if it picks up. All the things that I love in/about the Valdemar books (and the reason why I keep reading them) are there - kid/adult being rescued by their Companion out of a dire situation, finds a friend and purpose with their Companion, finds more friends (and sometimes love), has adventures and we get to discover more and more about the world of Valdemar. <3 <3 <3 I don't ask for much more in a comfort read - which these books are definitely are (despite their sometimes very heavy themes I love it. All the things that I love in/about the Valdemar books (and the reason why I keep reading them) are there - kid/adult being rescued by their Companion out of a dire situation, finds a friend and purpose with their Companion, finds more friends (and sometimes love), has adventures and we get to discover more and more about the world of Valdemar. <3 <3 <3 I don't ask for much more in a comfort read - which these books are definitely are (despite their sometimes very heavy themes and subjects). Dallen makes me very curious. Maybe I'm interpreting too much into it but for me it seems like that he is a bit more than just an ordinary Companion. I also loved to see all the things we already know from the Arrows triology just being introduced to the world here - the Collegia. Having the Heralds being taught in classrooms instead of one on one. And, I think Mags will make sure that some other things (like Heralds being able to sew and cook and so on) will be taught too. The mention of Bard Stefen and the vrondi? Made my heart hurt. My first expression of this book was: 'I've read this.' It began the same way as the other books and had the same format. A poor child in a poor environment meets their horse and becomes chosen and have an adventure together. Unfortunately where others had been good and entertaining to read, this fell flat. Mags didn't bring anything new to the table and I even felt bored to read the story. This book might be a good one to one who hasn't read all about Valdemar or has taken a first step to Merced My first expression of this book was: 'I've read this.' It began the same way as the other books and had the same format. A poor child in a poor environment meets their horse and becomes chosen and have an adventure together. Unfortunately where others had been good and entertaining to read, this fell flat. This author was recommended to me and apparently she writes short series that all have the same setting like Tamora Pierce, so I went to the library and just got the only one that was the beginning of a series. There were a couple places where explanations seemed abrupt and I'm guessing there was more info in books I should have read before this, but I still understood what was going on just fine. Anyway, this book had the feeling of older (80s/90s) fantasy and I liked it a lot. Great book, feel like I really know the characters, but the ending left me hanging. This is a re-read and I really enjoyed reading the beginning of the story of Mags. Yay for Mags! I love this series. Sick abed, nothing better than to stumble across a new series. Loved this book - and will be devouring the rest in the series as quickly as possible. So I really liked this book! One of my favorite novels of Valdemar is Brightly Burning, and this had many of the aspects of that novel that I liked, although you can tell this one is set up as a series as opposed to a stand alone. It had the lonely, abused boy getting Chosen and his world changing for the better. He struggled with learning the rules at the Collegium, but makes friends and uses his particular gift. At the same time there are events afoot that not even we as readers are privy too, So I really liked this book! One of my favorite novels of Valdemar is Brightly Burning, and this had many of the aspects of that novel that I liked, although you can tell this one is set up as a series as opposed to a stand alone. It had the lonely, abused boy getting Chosen and his world changing for the better. He struggled with learning the rules at the Collegium, but makes friends and uses his particular gift. At the same time there are events afoot that not even we as readers are privy too, and although we don't get a full explanation, I fully expect more from book two. Now all I have to do is wait until pay day to buy the next book!